Those starting out with scuba are not only advised to take classes, they're generally required for rental of tanks, purchase of air and so on. Diving isn't something that's picked up in 20 minutes either. In fact, even experienced divers continue to take lessons or even prefer to teach them to help themselves stay on top of the game. Remember the world underwater does not belong to humans, so a solid understanding of how to survive is vital. With proper use of diving equipment such as facemasks and air tanks, humans can descend into the world where sharks and whales rule; a place of shipwrecks, corral beds, colorful fish and more. But this world is inhospitable and requires a keen understanding for safety. Those starting off will find the road to underwater depths takes some time to master. Recreational scuba divers generally stick to depths of 130 feet or less. Training for this is not as intensive as deep water diving since these dives don't generally require decompression stops. When required these stops help the body pressurize to the new environmental conditions. Gravity has a new feel on the body under water than it does on land. Just like riding in an airplane, an adjustment period is required. For those new to scuba, three different scuba certification agencies might be run into. The Professional Association of Diving, or PADI, is perhaps the best known. Then there are the National Association of Underwater Instructors, or NAUI, and the Scuba Schools International, or SSI. 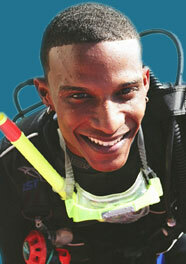 All three provide classes to get divers started on a hobby that's incomparable in adventure. Basic classes start off with classroom instruction to help students become familiar with the gear. This includes tanks, gauges and so on. Once students are comfortable with the gear, it's time to put it on. Swimming with scuba gear is not like jumping in the water in simply a suit. It's a whole new experience that requires some getting used to. This is where most schools will do "pool dives" to help acclimate students to the gear and its feel underwater. Pool dives can be done right in a school's own facilities, but oftentimes community pools are used. It is during this part of the lesson that potential scuba divers are born and those who might not find the sport to their liking will begin to discover this. Scuba is a serious sport that requires knowledge and understanding for safety. Many diving schools will offer starter courses that continue for anywhere between four and eight weeks, depending on teaching style. Each lesson is important before recreational diving is attempted without an instructor present. In addition to diving, they generally include basic first aid and CPR. After students are familiar with gear, understand how it feels, and are adept at reading its instruments, many schools will offer real dive excursions for beginning divers. These are valuable to attend and they give the first real glimpse of the world that awaits beneath the water. Scuba diving and scuba gear.